Is School Controlled by ACA Members on Board and Administration? 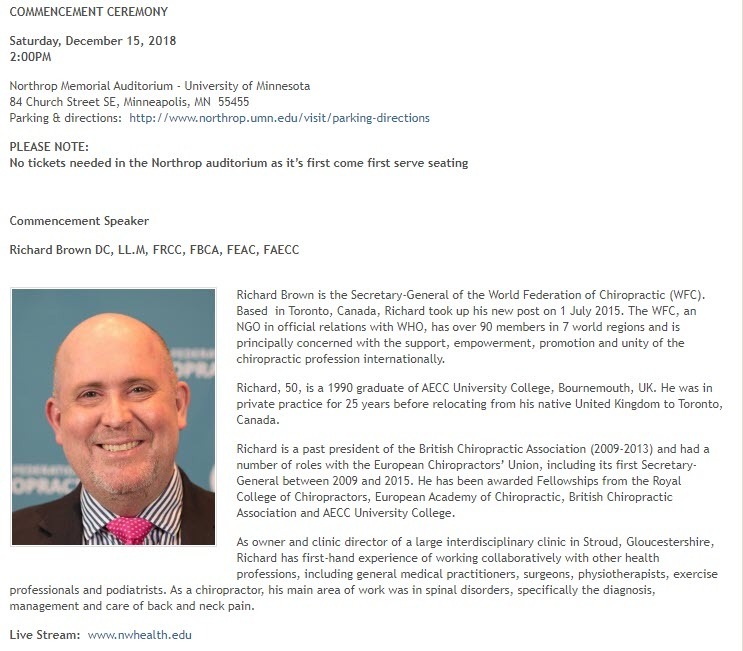 According to Northwestern students, and an announcement from the school, the World Federation of Chiropractic's Secretary General Richard Brown DC will be giving the commencement address at the December 15, 2018 graduation ceremony at Northwestern Health Sciences University. Brown is a well known subluxation denier and critic of the management of vertebral subluxation referring to those who practice in such a fashion as practicing a psuedo-religion and a cult. Brown has called for those who practice this way to be "eradicated". Brown is the immediate past President of the British Chiropractic Association and has stated his and the BCA’s support for prescriptive drug rights for chiropractors as well. “This decision will provide significant benefits for patients and complement the care they are able to receive from physiotherapists and podiatrists. It will also reduce the need for patients to return to their GPs for their medication”. “The BCA, which is committed to improving quality and enhancing patient choice in the provision of musculoskeletal services, has already made representation to the statutory regulator, the General Chiropractic Council for the chiropractic profession to acquire prescribing rights and supports on-going dialogue to achieve this objective." In addition to his support for drug rights, Brown is also a harsh critic of subluxation centered chiropractors. It is not known what, if any, organized group of chiropractors Brown is referring to but certainly the International Chiropractors Association, which is a dues paying member of the WFC, supports pre-payment plans for subluxation correction. Is he referring to ICA members who see high volume and assist their patients with pre-paid plans of care to reduce or correct subluxation? The invitation for Brown to speak comes on the heels of the re-branding of the American Chiropractic Association (ACA) and its adoption of guidelines that make it impossible for an ACA member to practice the management of vertebral subluxation. Northwestern appears to be joining other schools that have come under the control or influence of ACA supporters including Palmer and Logan.